It’s much more than a form builder! Do You Want To Build a Job board, Classified Site, News Site, Book Store, Directories? Or Any Interactive Website. Or you may want to allow your users to publish the posts from the frontend. Or may be to allow your users to register or edit their profile or to replace the default WordPress Login, Log Out, Lost Password. Then Forms Management System Is Your Best Choice. Wait a second...you know what?!? its more than a form builder. see some of its features below. 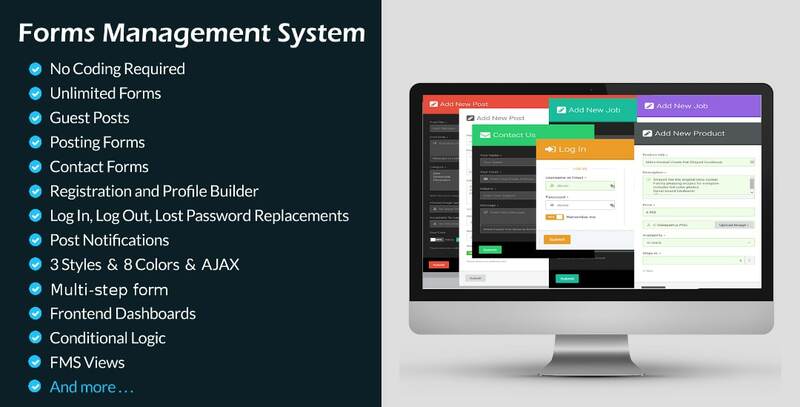 Forms Management System is a full solution frontend plugin to build advanced posting forms, guest forms, registration and edit profile forms, contact forms and frontend dashboards for WordPress with a visual so easy to use forms builder. Just focus on your website and let Forms Management System handles all the forms for you. The textarea now can be: Textarea Normal, Rich textarea(Visual Editor), and Teeny Rich textarea(Visual Editor). FMS API Now the FMS has many hooks and if you are a developer you can use its hooks to modify its behaviour or to build your add-on for it. If you need any help please contact us. You can create child plugin for FMS now. Option for making the form full width. and another option to disable the form styles. Select which links you want theme to appear in the front-end dashboards. Unlimited Front end Dashboards! Now you can specify specific dashboard for each post type, or create a dashboard for two post types only, or any number of post types you need the dashboard to get its posts, or get all posts type in a single dashboard the options is limitless. Toggle Switches. Now you can change the style of the checkboxes and radio fields to amazing Toggle Switches styles and make it round or leave its default cool Toggle Switches style. you can see it live on the demo website forms. FMS Views shortcode allows you to display any or all custom fields in the frontend anywhere in your website for logged in or not logged in users with many other options. Display edit link or delete link or both with your post. New Google no CAPTCHA reCAPTCHA. Two themes for Google no CAPTCHA reCAPTCHA. Now you can upload as many number of images as you want or unlimited with Image Upload custom field. Now you can upload as many number of files as you want or unlimited with File Upload custom field. Now you can set your own sender name and email address. Many of our clients uses an independent plugin to achieve that. Now FMS solve that for you. SSL compatibility, no matter if you used FMS forms on HTTP pages or HTTPS pages and you forced SSL for dashboard or not FMS will still working perfectly. 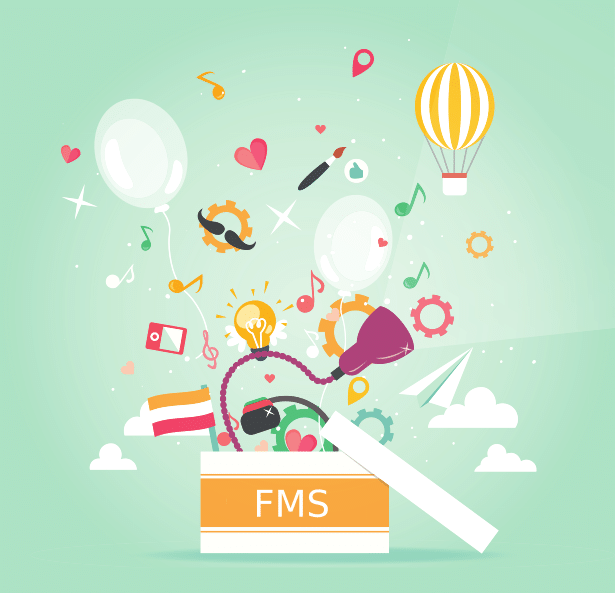 Now you can overwrite the FMS's PHP files in the FMS's child plugin. Many of our clients created amazing frontend dashboard from our simple dashboard and they needed the ability to overwrite the default dashboard and because of that we added this feature. For more info please see the FMS's documentation. Now you can specify the posts categories at the frontend dashboard, e.g. you can display the posts only within the "Uncategorized" category or within as many categories as you want or within all categories. Forms Management System Views Builder free add-on. Option to disable firing the google map library at the frontend. Now FMS shipped with Masonry JS library and Colorbox jQuery plugin with options to disabling them. Now you can specify the number of posts at the frontend dashboard. Backend Custom Fields free add-on. Now you can import & export forms and settings. Local Storage, no matter if your users lost the internet connection or even their browser crashed suddenly, or maybe they shut down their computer and switched it on after few days when they will open the form again they will find the data exactly like when they left it! Now you can allow your users to insert images or any media(video, audio, etc.) within the post content, excerpt or any textarea custom field. Post expiration functionality, for more information about this feature please read this article from the documentation. Compatible With Contact Form DB Plugin. Insert bulk options functionality in the dropdown field, multi-select field, radio field and checkbox field. Add "Simple" option in the Terms field. The dashboard pagination work using Ajax. Delete post done using Ajax. Warning the user before leaving with unsaved changes. Warning the user about unsaved changes at form editor. New conditional logic comparison operators. Add duplicate the form builder fields feature. Visual form builder You will never write a code! Unlimited Forms Create as many forms as you want like guest post, post submission, contact form, job submission, classified submission, etc. Guest Posting Support Let your users publish the content on your website without registration. Auto Registration If you want to register your guests automatically while they publish the content on your website. Custom Post Type Supported Let your users submit the content from the frontend in any post type (posts, pages, custom post types, etc.). Custom Taxonomy Supported Add your own custom taxonomy to your frontend form and view them as dropdown menus or checkbox …etc. Custom Fields Supported Add as many custom fields as you need and you can choose from too many custom fields and there are many other fields that we will be added in the future releases. Custom Redirects Redirect your users to a page or custom URL or to the newly created post or display a cool message when they submit a new content on your website, you can also set these settings when users update their posts. Set Post Status When users submit a new post or update it,then the post can be set to any status you prefer (Draft, Pending Review, Private, Published). New Post Notification, Update Post Notification You can get an email notification whenever the users add a new post or update a post. Without visiting your site’s dashboard. you can get an email with all the post information including: post title, content, excerpt, tags, category, author,site name, site URL, permalink, edit link, and any custom fields that you have in your form. Post Format Supported Specify the post format for each form. Post Draft If you want you can allow your users to save their posts as drafts. Frontend Dashboard Allow your users to edit and delete their posts from the frontend by listing their posts in an awesome front end dashboard. 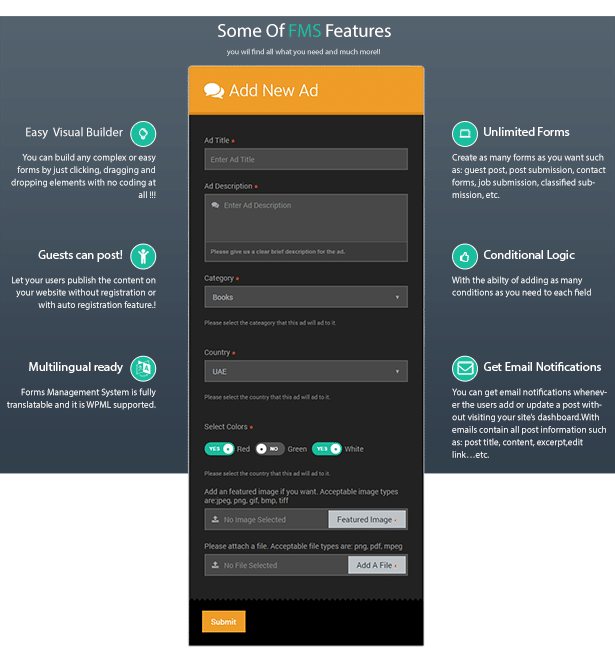 Full Featured Contact Form With The Same Awesome Visual Form Builder And Amazing Features. Custom redirects in contact form. Redirect your users to a page or a custom URL or display a cool message when they submit the contact form. Bundled With Simple Form Validator – PHP Class (That is an extra value of 7$ included). Three Form Theme Styles based on Smart Forms (That is an extra value of 11$ included). Custom CSS & JS Create your own custom CSS or custom JS file then name it fms-custom-css.css, fms-custom-js.js and put it in the FMS child plugin folder. Secure: we are confident enough to tell you… yes it is secured. Configurable: everything is configurable even client side validation messages! Developer Friendly: we stick on the rules, so we did not use any custom PHP code, we only used WordPress functions, actions, filters, etc. In addition, we always restrict ourselves with WordPress Coding Standards. Therefore, you can very easy use your preferred actions and filters with Forms Management System. Limit Characters Or Words Count. MOSTASHAROON & Envato Purchase Code Validation. 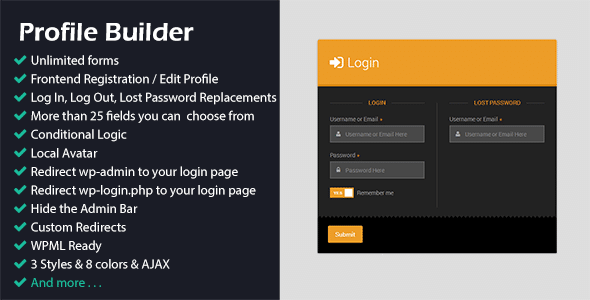 If you need to add the registration/edit profile, login, logout, lost password and much more features that related to the registration process that we are talked about here, then you should install the Profile Builder add-on. No refund available for this plugin. Thank you for understanding. What you can achieve with Tajer and Forms Management System? You can force your users to pay in order to publish new posts also you can create a subscription, for example, each year the user must renew his/her subscription in order to publish new posts. You can create many plans, for example, a plan allows the user to publish 30 posts and another plan that allow him/her to publish 100 posts and so on and so forth. You can create FMS posting form that publishes featured posts and only subscribed users(paid users) can use this premium form, you can also put a featured expiration date, after that date the post become a normal post. You can allow the users to publish just four posts for free(any number) then if they want to publish more posts they should be subscribed in order to do that. You can ban the users from accessing the custom fields section of the posts, so only the subscribed users can access them. You can charge for your posts for a number of characters or number of words, you can do that with FMS plus Tajer. Post expiration date, move to trash or force deletion. Actually, the possibilities are limitless, do you have a special case? let us hear from you by contacting us about it. Compatible With Contact Form DB Plugin! Saves submitted contact form data to the database. Export the data to a file or use shortcodes to display it, Contact Form DB plugin contain a lot of amazing features we will leave you to discover it by yourself! Forms Management System add-ons released! - New: Multi-step form feature. - New: The dashboard pagination work using Ajax. - New: Delete post using Ajax. - New: Warning the user before leaving with unsaved changes. - New: Warning the user about unsaved changes at form editor. - New: Conditional logic comparison operators. - New: Add duplicate the form builder fields feature. - Enhance: A lot of new hooks, global variables and arguments. - Enhance: Delete jquery-ui-1.10.4.custom.min.js file. - Fix: Issue with the conditional logic. - Fix: A lot of minor issues. - Enhance: remove background color of field success state. - New: compatible With Contact Form DB Plugin. - New: Repeat Textarea field. - New: new fms_html_field_help hook. - New: new fms_valid_contact_form hook. - New: insert bulk options functionality in the dropdown field, multi-select field, radio field and checkbox field. - New: add &quot;Simple&quot; option in the Terms field. - Enhance: allow HTML in the Terms field. - Enhance: enhance the textareas help text. - Fix: fix conditional logic unexpected behavior. - New: post expiration functionality. - New: post expiration field. - New: post expiration meta box. - New: new slider custom field. - New: new functions and hooks. - New: Smart Forms &amp; Simple Form Validator – PHP Class now included as separate packages in addition to the implemented files. - Enhance: enhance some functions and hooks. - Enhance: update forms-management-system.pot file. - Enhance: cancel escaping HTML characters in the fields help textarea. - Fix: fix images overlap on page load when displaying the images of the image upload custom field using Views Builder add-on. - New: Local Storage feature. - New: inserting images or any media(video, audio, etc.) within the post content, excerpt or any textarea custom field now is possible. - New: wrapper class fields option. - New: fully compatible with PHP7. - Enhance: TinyMCE background color. 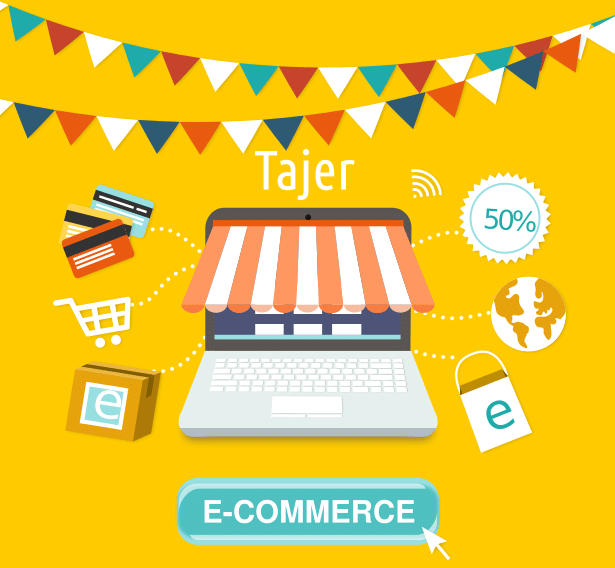 - New: compatible with &quot;Tajer&quot; All In One eCommerce WordPress Plugin. - New: compatible with &quot;WP Premium Posts&quot; free add-on. - Enhance: allow HTML in the message field. - Enhance: enhance some current hooks by adding new parameters to them. - Enhance: enhance form builder styles. - Fix: contact form slashes issue. - Fix: Google map sensor parameter warning. - Fix: SSL mixed content warning. - Adding $post_id parameter to fms_post_content hook. - Adding $is_update parameter to fms_after_insert_post hook. - Fix Tags field order issue. - Fix post format issue. - Improve the conditional logic. - New option for the dashboard shortcode. - Fix AJAX response issue. - New Backend Custom Fields free add-on. - New Import &amp; Export Forms &amp; Settings features. - Enhance AJAX respond reader. - New latest version (version 3.1) of Smart Forms implemented. - New now you can specify the number of posts at the frontend dashboard. - Restyle the dropdown field. - Restyle the repeatable field. - Refactor the plugin code for better performance. - Fix google map issue. - New Forms Management System Views Builder free add-on. - New option to disable firing the google map library. - New now FMS shipped with Masonry JS library and Colorbox jQuery plugin with options to disable them. - Change the behaviour of the incorrect form settings from redirecting to an undefined page to display a JS notice. - Restyle the not guest form for not logged in users. - Restyle the files and images appearance while editing the posts. - Deprecated the AJAX disabling functionality. - Remove the CSS reset code. - Fix the conditional logic with reCaptcha, Simple Captcha, and Terms fields. - Fix really simple captcha compatibility issue. - New support multiform on the same page. - New ability to display the posts within specific categories in the frontend dashboards. - Fix issue with multi date and date &amp; time fields. - Fix issue with multi TinyMCE. - New more features for FMS's child plugin. - Fix retrieve the old value of non-hierarchical taxonomies when editing the post. - Compatible with old versions of PHP. - Fix bootstrap themes conflict style issues. - Fix Post Status issue while Post Draft is enabled. - Refactor some of the plugin code for better performance. - New set your own sender name and email address. - New now you can upload more than one image in the image upload custom field. - New now you can upload more than one file in the file upload custom field. - New two themes for Google no CAPTCHA reCAPTCHA. - Restyle Google no CAPTCHA reCAPTCHA for better harmony. - New Google no CAPTCHA reCAPTCHA. - Change media uploader security checks. - New display edit link or delete link or both with your post. - Refactor the frontend AJAX code for better performance. - Refactor the frontend conditional logic code for better performance. - Fix AJAX bug in Firefox. - Refactoring the plugin code for better performance. - New WooCommerce support (Alpha). - Refactoring the contact form code for better performance. - New Date &amp; Time custom field. - New the textarea now can be: Textarea Normal, Rich textarea(Visual Editor), and Teeny Rich textarea(Visual Editor). - New the contact form can send HTML now. - New we started to creating API for FMS, now it has many hooks. - New you can create child plugin for FMS now. - New option full width form. - New option disables form styles. - Enhance the form builder UI for better user experience. - Enhance the Setting API UI for better user experience. - Adding more topics to the documentation, and the documentation now available in PDF, Word 97-2003, Word 2013 versions. - Fix Multi Select field conflict with Conditional Logic. - Fix Stepper field conflict with Conditional Logic. - Fix Conditional Logic for checkbox field. - Fix guest post submitting. - New select which links you want them to appear in the frontend dashboard. - Change the form icons. - Enhance the setting API performance. - New add Toggle Switches styles to the radio and checkbox fields. - Remove the setting API class and create our own setting API. - Make it compatible with Registration and Profile Form Builder Add-on. - Enhance the message field look. - Fix support links issue. - New unlimited frontend dashboards. - Enhance the behaviour of required fields. - Fix problem with edit post form.